I am a fellow arms warrior who is having mega problems with my dps. Currently at about 843 ilvl and pulling 160-180k dps. After researching on here I think my issue is coming down to over using fr and not slamming enough. My problem is I can't really see my fr stacks very well, so does anyone have a suggestion on a good add on to use to either move the buff or make it larger or something? Thanks!! WeakAuras is set up to do exactly this. UI elements and setup is a very personal thing. You'll have to figure out what works best for you. 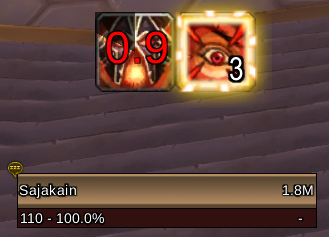 To help you out, though, I would recommend looking at one of two addons: Weak Auras or Tell Me When. Personally, I use both for various reasons. Both of them do essentially the same thing, however. It's all nice and shiny, big number three, very noticeable. Over-using Focused Rage is a huge problem for many warriors and this is just one way to help make you aware of your stacks. If you have any other questions, don't hesitate to ask. I hope this helps. Awesome thanks for the replies that is extremely helpful! Does Tell Me When show your FR stack count at all times and then glow at 3? I was trying to get this affect with WeakAuras but as of right now I am just displaying my stacks in the center (which is just fine). Id like it to glow though when it hits 3. If you know how to acomplish this with WA please let me know :D Otherwise maybe Ill try Tell Me When as well. The icon is actually hid until it hits three stacks. When that happens, the icon shows and lights up. I, by default, show stack counts at all times for most of my buffs anyway. You can, however, set it (in Tell Me When) to flash at a specific stack count if you want it to (if you're constantly showing the buff. Here's a Weak Aura that I made. It, in a nutshell, does the same thing that my Tell Me When icon does. It activates on three stacks, shows a faded CD, and glows. If you need anything else done to it, let me know. I do not use Weak Auras a lot for making custom auras.